The Social Media World Forum Europe, set to kick off in London next week, will be integrating the RFID social media platform, LifeSynk, to demonstrate how brands can get people to share physical and point-of-sale experiences on Facebook and other social networks. LifeSynk works by linking the user’s social media network account to an RFID card. Physical venues such as stadiums, theaters, shops or cinemas run promotions that award discounts or loyalty points every time a customer swipes their LifeSynk card. Brands can also use LifeSynk to conduct online conversations, focusing them to drive foot traffic and generate measurable return on investment. Users are able to view all promotions that are available, using LifeSynk, thus allowing brands an effective platform to promote their campaigns. The RFID solution generates access to analytics showing locations, who swiped what, how many times, demographics, thereby allowing businesses to track the number of customers drawn to the venue via the sharing and word-of-mouth of their friends. 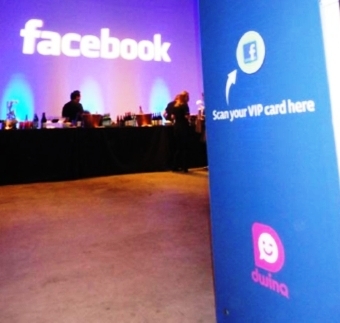 At the Social Media World Forum, held March 27 – 28, 2012 in London’s Olympia, delegates will each be able to pick up their own RFID card. ‘Like Terminals’ will be placed at either side of the auditorium where registered users can swipe to show that they enjoyed the talk and share this, and the fact that they are at SMWF, on Facebook or Twitter.